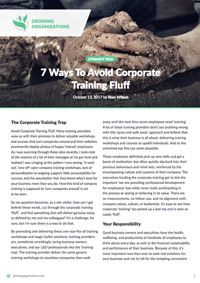 Avoid Corporate Training Fluff. 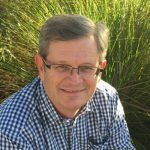 Many training providers wow us with their promises to deliver valuable workshops and courses that turn companies around and their websites prominently display photos of happy ‘trained’ employees. As I was scanning through these sites recently, I took note of the essence of a lot of their messages at my gut level and realised I was cringing at the pattern I was seeing: ‘in-and-out’, ‘one-off’ open company training workshops, lack of personalisation or ongoing support, little accountability for success, and the assumption that they know what’s best for your business more than you do. How this kind of company training is supposed to ‘turn companies around’ is yet to be seen. So my question becomes, as a site visitor, how can I get behind those words, cut through the corporate training ‘fluff’, and find something that will deliver genuine value, as defined by me and my colleagues? It’s a challenge, for sure, but I’m sure there is a way to do that. By promoting and delivering these one-size-fits-all training workshops and magic-bullet solutions, training providers are, sometimes unwittingly, luring business owners, executives, and our L&D professionals into the ‘training trap’. The training provider deliver the same generic training workshops to countless companies then walk away until the next time some employees need ‘training’. A lot of these training providers don’t see anything wrong with this ‘spray and walk away’ approach and believe that this is what their business is all about; delivering training workshops and courses to upskill individuals. And to the untrained eye this can seem plausible. These employees definitely pick up new skills and get a boost of motivation, but often quickly slip back into their previous behaviours and mind-sets, reinforced by the encompassing culture and customs of their company. The executives funding the corporate training get to tick the important ‘we-are-providing-professional-development-for-employees’ box while never really participating in the process or seeing or believing in its value. There are no measurements, no follow-ups, and no alignment with company values, culture, or leadership. It’s easy to see how corporate ‘training’ has picked up a bad rep and is seen as costly ‘fluff’. Good business owners and executives have the health, wellbeing, and productivity of hundreds of employees to think about every day, as well as the financial sustainability and performance of their business. Because of this, it’s more important now than ever to seek real solutions for your business and not to fall for the tempting convenient quick ‘fixes’ that initially seem to tick the right boxes but are disconnected from you and your business and end up being a waste of valuable time and money. A good training provider knows that, even with all the care and good intentions in the world, one thing they can’t do is know your business as well as you do. In the end the responsibility never leaves your hands. Anyone who comes alongside to help should not and must not take over or dictate what’s best for your company. The good news is there has been a shift. The traditional ‘corporate training’ model is changing and among the junk pebbles of those who still claim to be omnipotent magicians are a few gems who have even scrapped the now-tainted word ‘training’ and replaced it (in name and essence) with ‘learning and sustainable development’. A valuable provider genuinely believes they are your servant. They listen to your challenges and aspirations and offer up-to-date validated knowledge and expertise that can truly make your company more successful. They will admit they don’t have all the answers and they won’t pressure you to do everything they tell you. They will serve and guide you and share responsibility for outcomes. These truly progressive facilitators of learning and development ­strategies understand they are there to make your burden lighter, clarify the picture, simplify your work, give you back your restful sleep, and actually make a measurable difference to business results. They know that to do this, their work must be designed with you in a way that is unique to your business, that transforms perceptions and culture across your entire company, and that focuses on real long-term growth and development rather than short one-hit-wonder workshops. 1. Are training providers genuinely focused on growing me and my unique business? Are they only offering you a list of run-of-the-mill stand-alone training programmes or do they work with you to specifically design a flexible learning journey that addresses your current and future challenges? A partner seeks first to understand your business, your vision, and the human performance dynamics in the company. They measure and assess, engage with key representative individuals across the business, and report their findings in a frank discussion before working with you to design solution options for you to consider. Be very cautious of those who start offering solutions before asking in depth and listening first. They may be much more interested in growing their own business than yours. 2. Do they have good up-to-date science and an understanding of adult learning behind what they do? Where are they getting their resources and materials from? Are they up-to-date? Are they validated and proven to genuinely drive change and deliver results? Do they have programmes specifically suited to your business? Are they willing to modify or even scrap programmes that are not delivering results? What learning models or facilitation methods do they use? Don’t be afraid to challenge them on this before committing to purchasing their services. 3. Will they stick with me without making my business dependent on their training? Sticking with you shouldn’t mean continuing to train your staff and take your money no matter the outcomes. This is obviously not in your best interests. The aim of any development service should not be to simply ‘train’ but to equip your people with cutting-edge knowledge, effective skills, and reliable tools to continue learning and growing long after they have receded into the background. This includes explicitly setting and reinforcing boundaries about decision-making and authority. 4. Will they genuinely seek to collaborate with my company to deliver sustainable long-term results? Discussions with you should be very real, honest and pragmatic. Plans are devised and implemented and the whole team is considered as those plans roll out. No-one is left behind. In this way the L&D specialist serves you, the leadership of the company, all employees, and the business. They are not just seeking a short-term cosmetic change, but a long-term, measurable, transformation aligned with your vision. They become your partner, offering you the full resources of their team to benefit your business. Look for case studies, reputable testimonials and validation before you agree to invest large amounts of money with them. You might run a test, spend a little, and evaluate before going further. If they’re not willing to do that, then think about what that means. 5. Will they respect my autonomy as a leader and decision-maker? A great partner respects every leader in your business without taking over and dictating where you should be going. They know their own silos of strength and the value they can offer while acknowledging the vast terrain – the space between mission and accomplishment in your business – that they know little about unless you tell or show them. They believe ‘one size does not fit all’ and they behave in ways that consistently demonstrate these beliefs and values when handling your business. 6. Will they ensure learning is applied to actual challenges in my business? In order for the learning to be most valuable to both the participants and the business, it is vital individuals and teams practise using their new knowledge and skills by applying them to their everyday challenges. After the learning event itself, they should be encouraged to continue applying the learning and reporting back to measure its ongoing effectiveness. 7. Are they authentic and do their values align with those of my company? Assess their alignment with those of the real values that drive your business. If you were going to employ these people and wanted to know how they might ‘fit’ into your team and how well they can do their job, would you hire them? It is also essential that results are evaluated and acted upon to ensure continuous improvement.